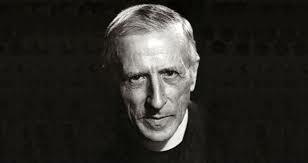 One of the most influential writers attempting to fuse science and religion in the mid-twentieth century was the Jesuit Pierre Teilhard de Chardin (1881-1955). His numerous works have stirred much controversy and merited a “monitum” or cautionary warning from the Holy See, something which in today’s ecclesiastical world might well be taken as a condemnation. Theologians and scientists have both raised serious objections to Teilhard’s use of the data and methods of their respective elds. Nonetheless, his theories have often been popularly siezed as a means by which the paradise of heaven and the garden of earthly delights may be fused into one easily achievable reality. In the article which follows, Sr. Isabel Mary Griffin identifies the concept of the “Body of Christ” as a central point of Teilhard’s teaching. In comparing this concept with St. Paul’s views on the same subject, however, the author finds the Jesuit’s ideas wanting, for they cannot be reconciled with the evidence of Scripture.